Exploration of the histories, cultures, and experiences of immigration to the United States by examining cultural production (literary and visual narratives and texts) alongside legal discourses (legislation, federal court cases). Remember: these are only suggestions. Further, this is not intended to be an exhaustive list. There are many other great courses described in the Course Explorer, some of which have prerequisites but are still open to undergrads. Do your own research and talk with your academic advisor to identify other good options. Apply for Summer Jobs and Internships. Do you have summer plans locked down? If not, apply for jobs and internships. Check out our internship newsletter over on our Compass page. We’ve also listed many internships on our Facebook page and on our blog! Use the search box on either of these to find internships. You should also be checking I-Link regularly (or set it to email you when new listings appear). Apply to Summer Pre-Law Programs. Apply for summer pre-law programs. These are typically 4 week residential programs to teach basics of law and how to prepare for law school, and most are free and come with a stipend for selected students. We have posted several in our blog and on our Facebook page. Take a look at the Summer Pre-Law Programs spreadsheet on our Compass page, listing over 40 summer programs, for even more opportunities. Note: Some deadlines have passed and others are April 1, so apply SOON. Take a practice LSAT. Not ready to take the real LSAT yet but wondering what it’s all about? Go to this website to download a free practice test. When you’re done, you can score it and watch videos there with explanations of the answers. Taking the June LSAT? You should already have selected your prep option and started studying. Spring break is a great time to crank up your LSAT studying.Tip: REGISTER FOR THE JUNE LSAT NOW, because the popular test sites do fill up around spring break each year. Decide who will be your recommendation writers. You will want to approach them by this May/June (at the end of THIS semester) so that they have plenty of time to write the letter and your performance is still fresh in their mind. It’s still a good idea to decide who on campus can write your recommendations, and approach them by the end of this semester. If you wait a year or more the professor is sometimes gone, on sabbatical, retired, etc., so it’s still a good idea to get them now. Register for the Credential Assembly Service as listed above so that you can send the letters in to your account. Apply for scholarships, like those we listed in this blog posting. Ask your law school financial aid office about scholarship opportunities. Connect with Pre-Law Advising Services! Join us for even more internship, scholarship, and event opportunities! Taking a Gap Year Before Law School, Wednesday March 29 at 5PM. Room 514 of the Illini Union Bookstore Building. Are you considering working before law school? Or want to know more about going straight through to law school? 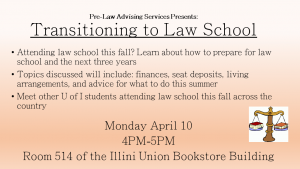 This panel will feature three current law students from the University of Illinois College of Law. They will discuss the pros and cons of going straight to law school versus taking time off and working. We will also share some tips and suggestions for students to maximize their time off and effectively highlight post-undergraduate skills. International Students’ Perspectives on Law School in the United States. Wednesday April 5 at 4PM. Room 504 in the Illini Union Bookstore Building. Are you an international student considering law school in the United States? Join us for this great panel discussion. The panel for this event will include two current international law students who will discuss their decision to attend law school in the United States. Topics discussed will include: the benefits and long-term value of an American law degree, visa processes, and life at an American law school. Transitioning to Law School. Monday April 10, 4PM-5PM. Room 514 of the Illini Union Bookstore Building. Attending law school this fall? Learn about how to prepare for law school and the next three years. Topics discussed will include: finances, seat deposits, living arrangements, and advice for what to do this summer. 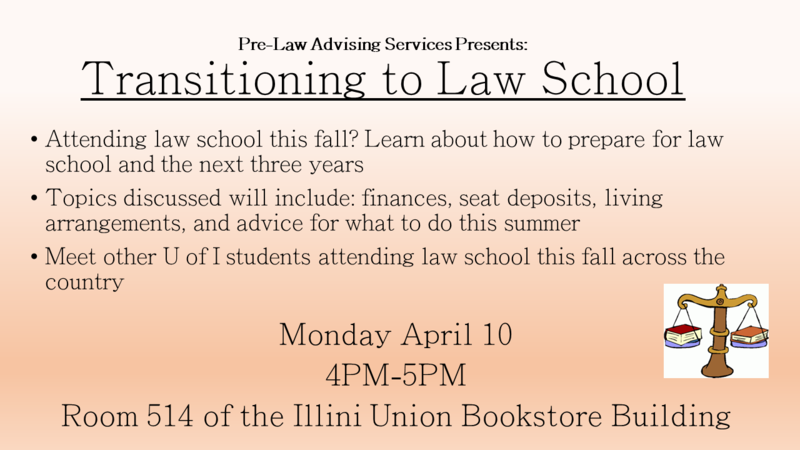 Meet other U of I students attending law school this fall across the country! MAFA meeting–Learn about the application process and what Illinois Law is looking for from Rebecca Ray, Assistant Dean of Admissions & Financial Aid, at MAFA’s meeting on Tuesday, March 14 at 7 pm in 165 Noyes. All students welcome. 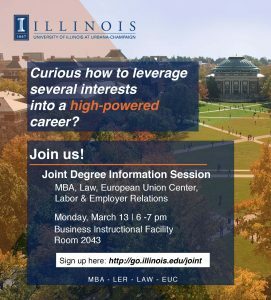 Joint Degree Info Session: See the signup link below. 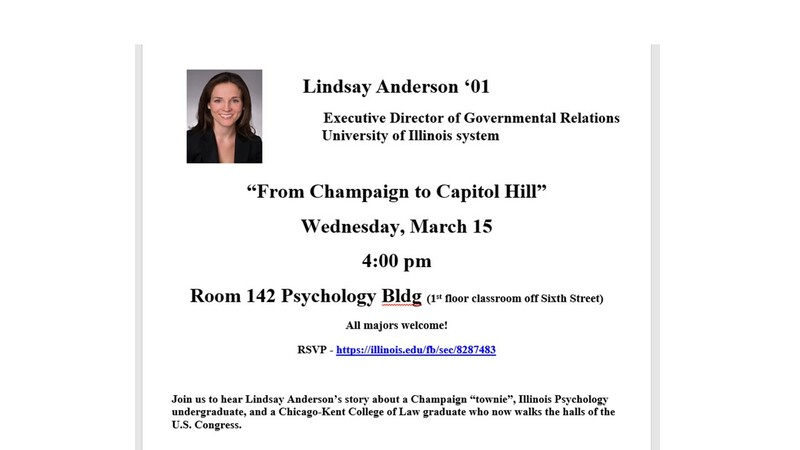 From Champaign to Capitol Hill--check out this alumna’s talk on her path to law school and now working in public policy. Career Center Workshops–Find the full list of Career Center events here. All workshops in the Career Center Conference Room 143 unless otherwise noted. We hope that you have been keeping up on our blog and Facebook posts about internships and summer pre-law programs. Another resource you should continue to utilize is our 20 page Internship Newsletter over on our Pre-Law Compass page that we posted in December! (Click here for instructions on how to access our Compass page.) 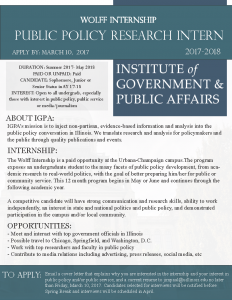 The Internship Newsletter has lots of job and internship listings for spring, summer and long-term opportunities from Champaign to D.C. and beyond. In addition, you should regularly check iLink to see if summer internships have been posted there. Waitlisted, or just waiting? What to do now. The school is essentially “waitlisting” you, but not calling it that, by waiting to respond to you until they see the rest of the applicant pool. IF it has been at least 4-6 weeks or whatever time frame the school has indicated as their response time, reach out and gently inquire about anticipated time frames for a decision. Reiterate your interest in the school. Don’t: (1) Complain about their slowness or criticize the school’s process; (2) tell them you’ve already heard back from everyone else or from “better” schools; or (3) give the school a deadline. Sometimes patience is key. If you’ve been waitlisted…Understand what this means: that you are an admissible candidate but the school needs to hit its institutional goals before they can admit you. Institutional goals could be LSAT/GPA related but could also be related to balancing the class with regard to gender, diversity, in state/out of state, age, etc. Very few schools can accurately predict how many applicants–and with what qualities–they will be pulling from a waitlist. When the school tells you they don’t know, it is very likely true. Follow the school’s directions carefully. Do not email to ask them what to do after the school sends very specific instructions. Some law schools will ask you to confirm that you want to be on their waitlist–if you don’t do so, you will not be considered. Continue to make other plans. No one should proceed by “expecting” to be pulled from a waitlist…even if this does happen, it can be anytime up to the day classes begin. You need to start making other plans if you haven’t heard by April or so. Be “pleasantly persistent” as we move into late March and April, which are prime decision-making times for schools and for entering students. And always remember that professionalism and good manners go a long way in this business! Thank you to everyone who attend our Negotiating Scholarship Workshop last Monday. We have other pre-law events at the end of the month and the beginning of April for you to look forward to, as well. Are you considering working before law school? Or want to know more about going straight through to law school? 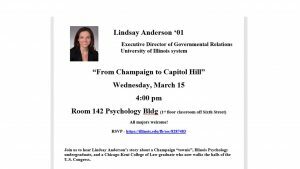 The panel will feature three current law students from the University of Illinois College of Law. They will discuss the pros and cons of going straight to law school versus taking time off and working. We will also share some tips and suggestions for students to maximize their time off and effectively highlight post-undergraduate skills. Are you an international student considering law school in the United States? Join us for this great panel discussion. Topics discussed will include: the benefits and long-term value of an American law degree, visa processes, and life at an American law school. Attending law school this fall? Learn about how to prepare for law school and the next three years. 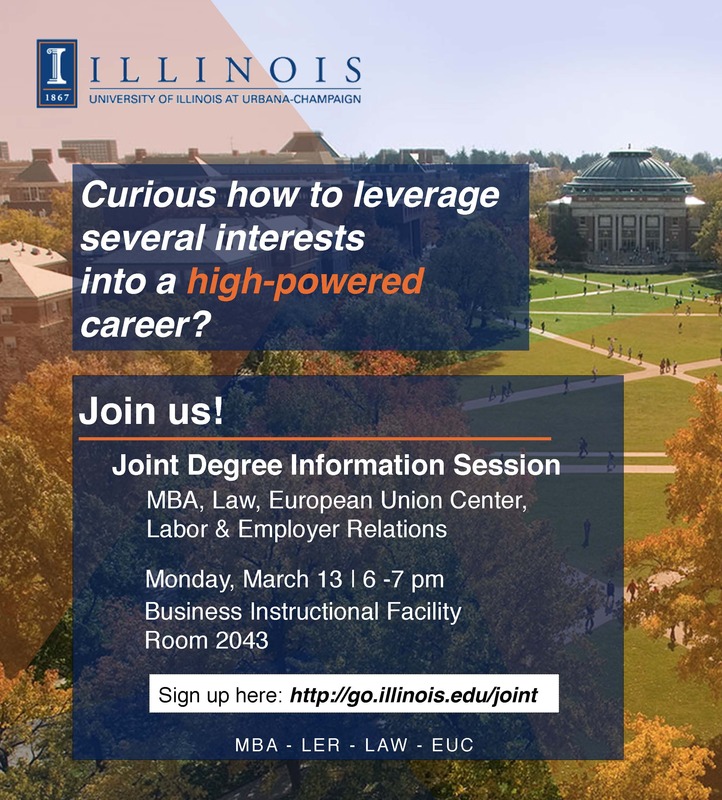 Meet other U of I students attending law school this fall across the country! The Writer’s Workshop is hosting a “Writing Effective Thesis Statements” workshop on Wednesday March 8 from 4PM- 5PM in 1062 Lincoln Hall. Gaining experience while in college is very important when it comes to finding employment after graduation. Learn how to search for internships and other opportunities by using different search engines including I-Link, Illinois’ campus-wide recruiting platform. March 7 from 5:00pm to 6:00pm. The workshop will be held in the Career Center Conference Room 143. March 8 from 4:00pm to 5:00pm. The workshop will be held in the Career Center Conference Room 143. Internship Opportunity! 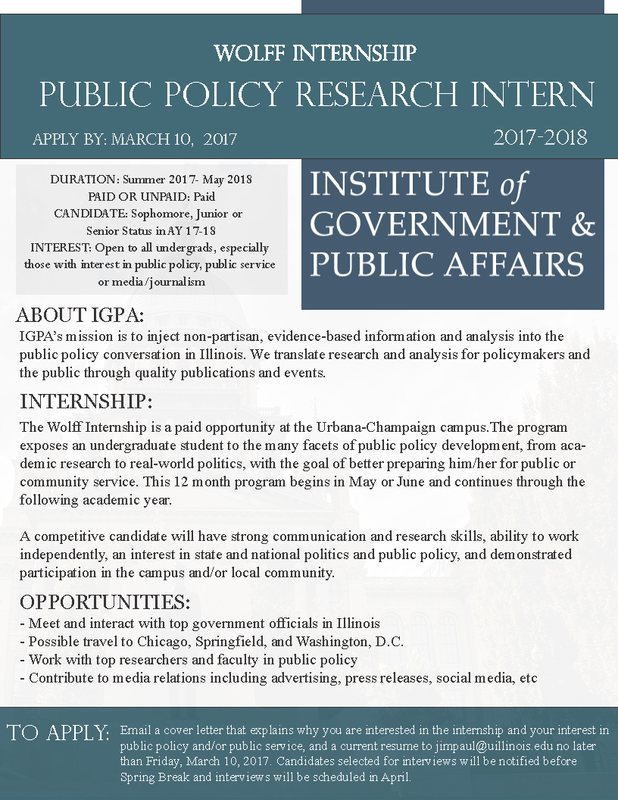 See the flyer below for more information on the Wolff Public Policy Research Intern position. Learn more about the new Sociology minor! There will be an Information Session for the new Sociology Minor in Crimonology, Law, and Society this week. The info session will be Thursday March 9th at 5PM in Lincoln Hall 3057. Negotiating law school scholarships has become quite common in the last few years. While many students have successfully bargained for additional scholarship dollars, the process of negotiating can be risky and stressful. On February 27, PLAS welcomed Rebecca Ray, Associate Dean for Admissions and Financial Aid at the University of Illinois College of Law who shared her insights on negotiating scholarships with law schools. For those of you who were unable to attend, here are some of the questions addressed. Dean Ray discouraged the use of scholarship reconsideration solely to leverage offers at other law schools. Remember: Most law schools’ initial scholarship offers are offers that they intend view as market competitive so don’t approach the reconsideration process assuming that the law school is using a “low-ball” offer as a starting point. As such, although it is fine to ask for reconsideration, in most cases the law schools say “No” more often than they say “Yes” to these requests. Also – some schools set aside a specific time frame for renegotiation. As such, pestering them for a final decision before their designated time for reviewing scholarships is not a good strategy. Dean Ray indicated that she was not persuaded simply by arguments that she “should match” another school’s scholarship offer. Do not turn the negotiation into something resembling haggling over a purchase of a used car. Note — there is nothing wrong with such a request. This is simply good lawyering by the admissions office. As such, if possible, you should attach the other competing scholarship offers to your reconsideration letter/email. That equals good lawyering by you! A peer institution could also be another law school in the same region or grouping of schools, e.g., Big 10 law schools, Chicago-area law schools. The definition is subject to interpretation by each law school. Note: This designation is important because most law schools consider scholarship offers from peer institutions to be more relevant in the reconsideration process.